At RollThisWay, we pride ourselves in providing a bespoke experience that you will not find anywhere else. This includes the highest quality seafood available, no artificial ingredients, as well as a friendly, outgoing and engaging staff that will make your event uniquely memorable. We believe in a catering EXPERIENCE that’s not just about the journey or the destination, it’s about BOTH. Your personal sushi chef will design innovative, mouth-watering sushi creations, right in front of your eyes. Whether a wedding for 300, a private dinner for 2, or an 8-course Omakase dinner for 10-20, our skilled sushi chefs come to your home, office or event venue, equipped with a mobile sushi bar buffet, stocked with all the accoutrements. All you need to bring… is an appetite. Planning your next office lunch or event and want something fresh, healthy and unique? RollThisWay provides an assortment of maki/sashimi/nigiri trays, + edamame, soup, salad and more. and so… RollThisWay was born. After moving back to his hometown of Toronto, Chef John Hoffmann honed his skills while traveling across Canada with Cirque du Soleil, feeding thousands of VIP clientele and later operating his first Sushi Bar at the prestigious Windermere House in Muskoka. Today, after hundreds of weddings, corporate lunches, bar mitzvahs, bachelorettes and birthdays, our team of skilled chefs are eager to make your next event one for the books. 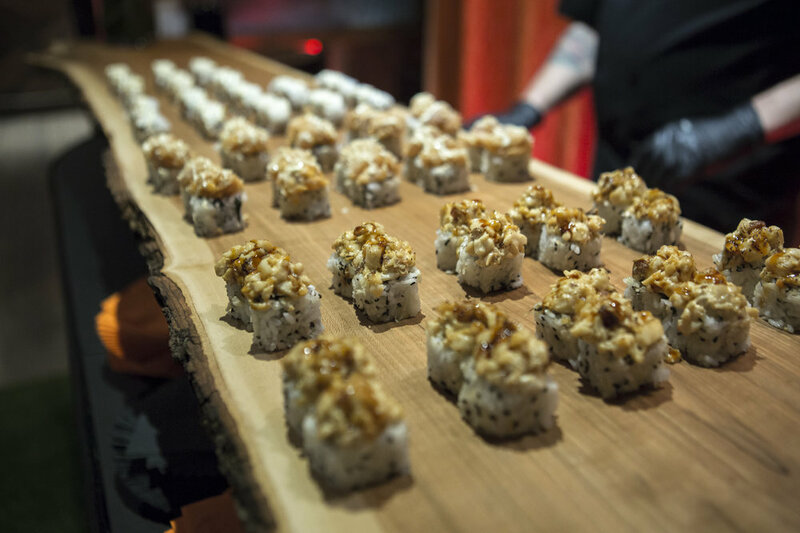 Let RollThisWay show you a different side of sushi catering. A sample selection of our menu. Special requests are available. Following the traditional art of Japanese Omakase, allow our talented Chef to elevate your dinner beyond your imagination. Our 8-course curated menu is a truly unique experience for you and 9-19 of your favourite friends. Prepare to be wowed. From small dinner parties to large corporate events, we’ve helped create unique and memorable experiences for all types of events. Here are a few of the partners we are proud to work with.